The Albert Area is located about ten miles northeast of Columbia, along Cedar Creek. From the intersection of Route Z and Route HH (at the �town' of Murry), turn east on Rob Cook Road, then take the first right on Zaring Road. Follow Zaring Rd south and then east until you reach a gated drive on the right just before a low-water bridge. 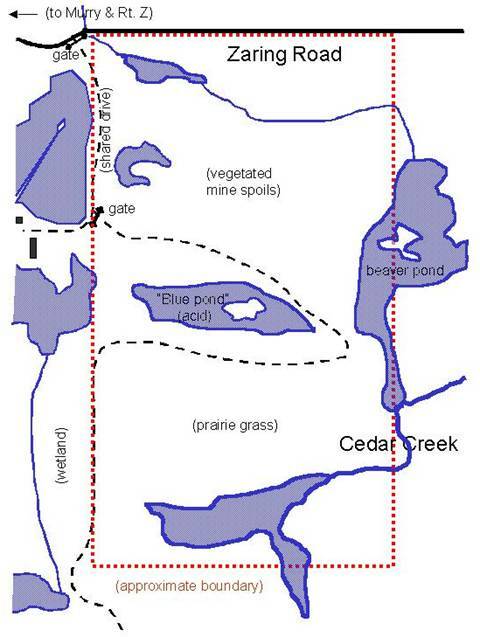 This drive (shared with a neighboring landowner) follows the west boundary of the Albert area until it reaches a second gate, which leads to the interior of the property. These gates are normally locked. Visitors can park along Zaring Road and access the area by foot, or contact members of the CAS Board or Nature Areas Committee to arrange to have the gates opened. , CAS Nature Areas Committee.